Although Ohio State University is well-known for having “the largest college campus”, (in addition to its academic strengths) the Philosophy Department should be known for its close-knit, social community. 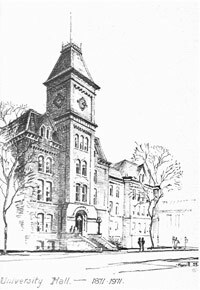 The Philosophy Department is housed in University Hall, a replica of Ohio State’s first building, which was built in 1873—the tower clock, entrance, and pillars are from the original building. University Hall was reopened in 1976, and in addition to the Philosophy Department, it conveniently houses the Graduate School. University Hall is centrally located on the oval (the primary, grassy, gathering place for the University), right next to the recently renovated main library (which has one of the largest collections in North America, and also conveniently has a café, and just over a block from the Wexner Center for the Arts, the gym facilities, and campus area cafés, pubs, restaurants, and varied shopping. The majority of the Philosophy Department is housed on the third floor of University Hall. On this floor, most of the graduate courses are held in our seminar room and most of the department colloquia are held in an adjoining room. There is our main department office, where you will find our secretaries and our department chair. While all the professors have their offices on this floor, there is also a partial kitchen with an eating area (where we sometimes have receptions after colloquia) and a computer room for graduate students. The third floor also has a Philosophy Department library; there are many large windows (overlooking the Main Library and the oval), several large tables for working, and our very own G. E. Moose. The graduate students have their own office on the second floor, where each student has his or her own desk (with locked storage to keep books, papers, exams, etc.). Additionally, this office has two sitting areas, chalkboards for meetings with students, and an additional computer. The close proximity of all of the offices and facilities offers an intimate community within the department. The department promotes many opportunities for rich philosophical interactions. In the department, impromptu conversations frequently occur in the hallways, The Turnbull Lounge, or the department’s library. There are several informal, ongoing reading groups. Our colloquia sessions are lively and exceptionally well attended by faculty and graduate students. There are usually plenty of opportunities for contact between the graduate students and speakers, including the tradition of a group of graduate students going out to lunch with the speaker before a talk. After talks, there is usually a reception in the department. Additionally, some visitors come to visit seminars (or reading groups) rather than colloquia. In addition to the regularly enrolled graduate students, most of our seminars also have auditing graduate students and faculty members sitting in and participating in the discussions. After many seminars, there is a tradition of continuing the conversations at a local pub. The faculty and graduate students (and their partners/families) also regularly get together for parties.